The Desert's Last Safe Haven Is a Lone Oasis You Call Home! 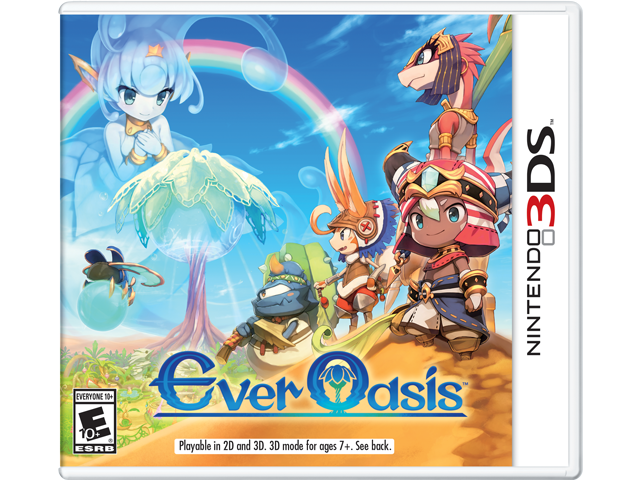 The Ever Oasis™ game is a new action-adventure RPG grown from the ground up by Koichi Ishii, creator of the Mana series and producer at GREZZO, the studio that rebuilt multiple The Legend of Zelda™ games for the Nintendo 3DS™ family of systems. Their team has crafted puzzles and traps too perilous for one hero to solve. So recruit a party of allies and level up their stats to learn new battle skills. Then return to your oasis and restore it: choose which shops to build, stock their inventories, collect a share of the profits, and keep villagers happy by fulfilling requests. Before long your oasis will blossom into a beacon of hope for all walks of life in the desert. Don't let them down.